"La lontananza nostalgica utopica futura. Madrigale per più caminantes con Gidon Kremer" for violin and eight track tape (1988/89), first performed in Berlin, September 3, 1988, by Gidon Kremer, belongs to Nono‘s last, extended compositions. Dominated by sustained sounds, highly differentiated and mostly very soft; disturbed by flickering harmonics or occasional eruptive outbursts; interspersed with silence; the score of "La lontananza nostalgica utopica futura" has the characteristic sonic appearance of Nono‘s later compositions, starting from the string quartet "Fragmente - Stille, An Diotima" (1979/80). The eight tape tracks consist of numerous sound fragments recorded during several days work in the studio with Gidon Kremer (and then partially electronically processed). On the one hand (for example, in the scraps of conversation) they document the phase of experimental studio work, focussing directly on the working process. On the other hand they allude to historical elements, by way of musical quotations or a quotation-like use of typical violin techniques. The tape constitutes a polyphonic sound texture into which the violinist must fit, interpreting the six sections of the score which are to be performed live. 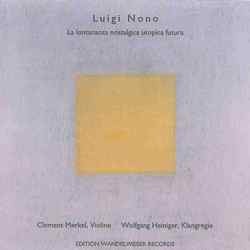 Nono stresses that this is not a concerto for a soloist with accompaniment, but rather a combination of voices with equal rights, as is suggested by the subtitle of the composition ("for several ‚wanderers‘ with Gidon Kremer"). A continuous interaction evolves between sound direction and solo player: the sound engineer reacts to the player¹s performance by selecting from material found on the tape and by distributing this selection amongst the eight speakers. The violinist for his part may interpret the rests within the six sections, as well as the phases between the sections, in accordance with the sounding tape material. In this way, over the course of the performance a lively relationship between the different components of the work develops.